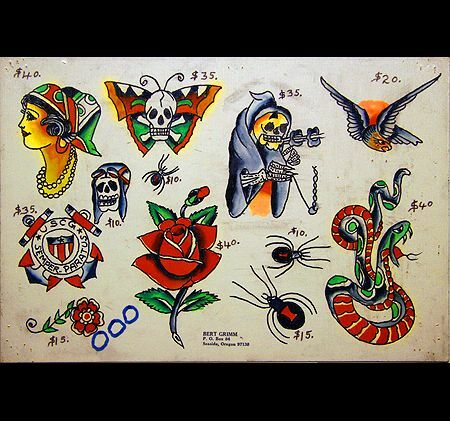 Few names are better known in the world of Los Angeles traditional tattoos than Bert Grimm. The man’s name defines old school tattoos on the west coast. Grimm started hanging out in Portland, OR shops when he was just 11 or 12 years old, getting his first tattoo machine at the age of 12. 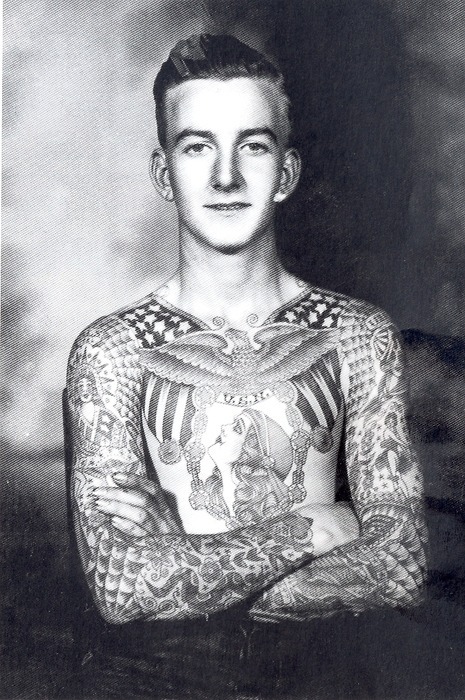 His home, however, was the famous Pike in Long Beach, where many of the legends on the early Los Angeles traditional tattooing scene were known to hang their hats. 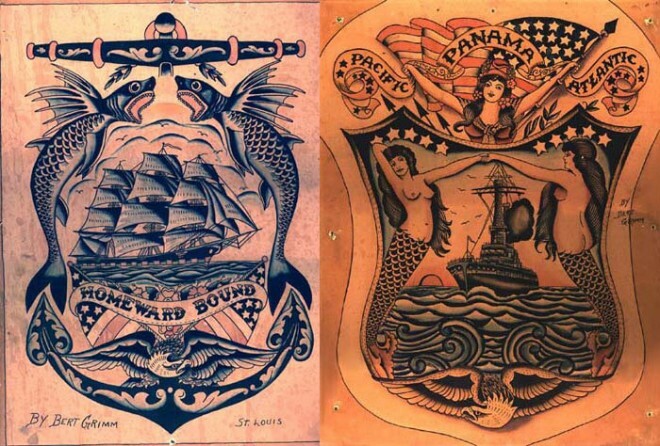 Bert Grimm’s traditional tattoo flash fetches big bucks now and it’s easy to see why: It’s so close to what you would find in an old school tattoo shop today, except it wasn’t done today — it was done 100 years ago. Anchors, dice, flowers, patriotic themes, chicks, knives, horses, Indians and crying babies — Bert Grimm did it all. His “Homeward Bound” and sailor girl pieces are imitated on just about every wall in every tattoo shop in America. 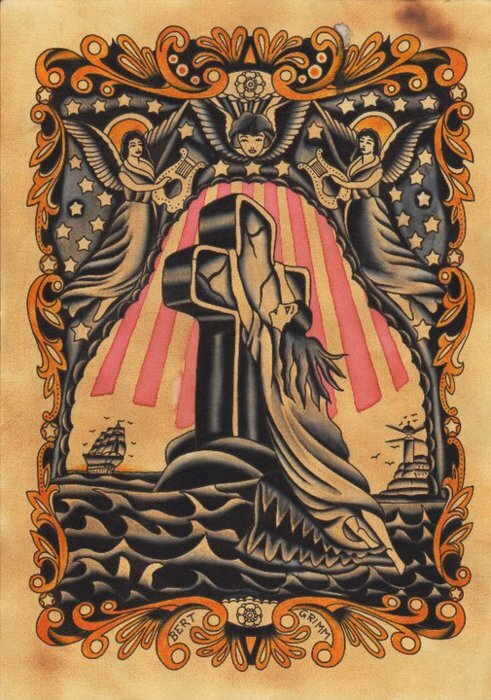 Much of what we now think of as American traditional tattooing was pioneered right here in Los Angeles by Bert Grimm: Thick lines, bold colors and tattoos that are built to last for years and years. Grimm also trained fellow LA tattoo legend Bob Shaw, another mainstay on The Pike and Nu-Pike down in Long Beach. Known as The Coney Island of the West Coast, Grimm tattooed near such greats as Lyle Tuttle, Bob Roberts and Don Nolan. One-time apprentice Bob Shaw displaying Grimm’s work. Still, Grimm often broke outside the confines of traditional tattoo tropes. A bull riding lightning through the clouds evokes a strong Asian influence and stands out from the rest of the pack. His “As You Are I Was / As I Am You Will Be” momento mori is striking in its simplicity. A skull with a Mexican Day of the Dead-inspired sombrero stands as an early example of Latin influence on American traditional flash art. A snake wrestling with a tiger exhibits dynamism in the largely static world of early American traditional. Grimm eventually retired to the small town of Seaside on the Oregon coast, but the art of tattooing was too much in his blood to stay away for too long; He did about 10 tattoos every week from his home, passing away in 1985. 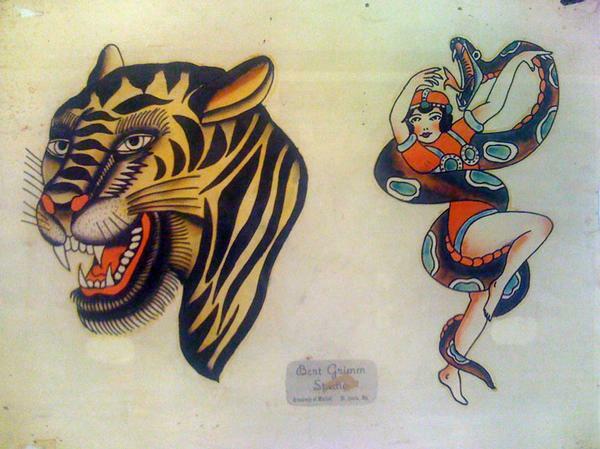 Check out heaps of Bert Grimm’s traditional tattoo flash art over at Lucky’s Tattoos Museum.